Bacon is one of the few foods that I believe goes well with everything. Bacon makes all things better. Now, combine it with one of America”s favorite foods, by topping it and stuffing it with bacon. Add cheese and sauerkraut with your typical condiments. Bacon inspires all. I”ve put potato chips on sandwiches, burgers, but never thought to put them on a hot dog already topped with slaw and sauces. Some believe that there is such a thing as too many condiments, or strictly using mustard and only that. It looks like the Columbian may change their minds. Pineapple is one thing I never thought of topping my wiener with. But along with chipotle sauce, sweet and spicy sounds good. A couple of jalapenos add a nice kick. I don’t know about the rest of you, but all weekend long I have been reaching, itching, longing for some crisp fall weather. I toiled for a while about what the hell to put in a jar this week. Fruit…again? I wanted comfort food. Something sweet, with chocolate…maybe some peanut butter and malt! Ok. OK. I told myself to get a grip. It’s August. I’ll have months and months of savory food up ahead. So, what did I decide to do instead…? We were on our third day of sightseeing benders in the world of rodent amusement parks when we ventured to “Tomorrow Land”—you know the one, with the gigantic golf-ball housing the “ride of tomorrow” that ends in some California garage? Unfortunately, the early 80’s tech-savvy scene failed to amuse our five-year-old tech genius. Nothing offered here could compete with our PS3 at home, so he decided to take his boredom out on the rest of us. Purely in the interest of self-preservation, I stumbled upon a stand selling mango-ginger-margaritas in China-land. My wife and I enjoyed 3 of these magical libations. (Yes. That’s 3 each.) I recreated these serenity slushies at home with positive results. I am not, nor have I ever been, a bartender. I love mixed drinks, though. And I’m super cheap, so I would much rather make drinks at home than pay upwards of $8 a glass on a super-sugary and not-alcoholic-enough drink. Now, I promised myself a while back that I would not buy any more coconut rum because it’s too easy to consume in mass quantities and regret it later. Buuuttt…I guess I break promises. 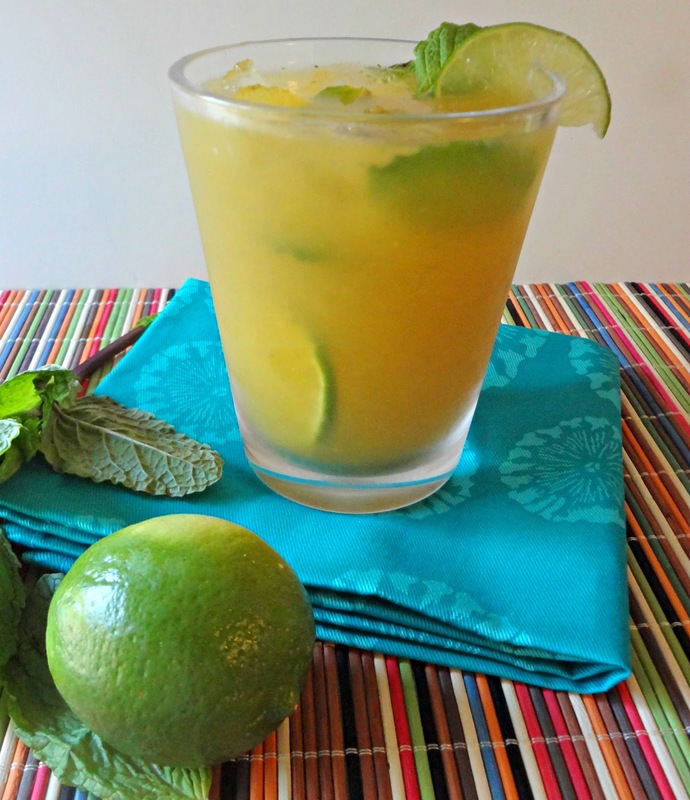 So, here’s a tropical drink to rock your socks.